My own quick list of what a freelance illustrator should never ever do. I could use a little reminding as well from time to time. 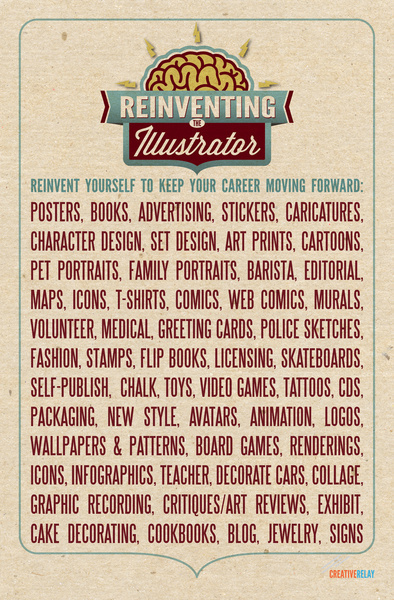 •Never ever forget about those personal projects Those personal projects fuel my creativity and remind me of why I loved being an illustrator in the first place. Plus they often lead to paying work. It shows clients what I’m passionate about and in return the projects that come up are always much more interesting and a better fit. •Never ever forget social media is mostly public. So act professionally at all times. It is a beautiful thing that clients love connecting with us via social media, but it is also one big water cooler for us illustrators to talk shop. Plus our family and friends are there too. It can be a weird mix, so keep it clean and positive. You never know who is watching. •Never ever forget there is an option to say “no.” With the feast or famine mentality of freelancing, it is so hard to turn down a job. Sometimes the reason I should say no is so obvious (the budget is too low, crazy deadlines, the project is simply not interesting) and yet I still find myself thinking it over. But I have to tell myself saying “no” means saying “yes” to myself (and yes, it is truly a cheesy line, but I love it). That always puts things in perspective and makes it a lot easier for me to say no. •Never ever forget there is life beyond work. The creative well needs to be filled with life experiences. When I was starting out, I would barely take a vacation. As freelancers, we somehow always end up working around the clock. I definitely take vacations and mini trips here and there now. There will be times I will still need to work during vacations (okay, let’s face it, I always do) but with enough planning ahead and making it a priority, it is possible to get a break! •Never ever forget to sleep. It’s a good thing! Sleep gives us energy. You will do better and think better if you have more energy. The same amount of work will take less time if you are fully rested. Know how your energy levels are throughout the day and try to match the type of work you are doing to maximize your time. It works! I try to always have this in mind, so this was a good reminder!